Asada, Y., Kawamura, S.: 1986: Screening for cyanobacteria that evolve molecular hydrogen under dark and anaerobic conditions. : J. Ferment. Technol., 64, 553-556. Lee, K.-Y., Park, J.-H., Park, B.-S.: 1996: CO2 fixation and SCP production using blue green algae. : Theories and Applications of Chem. Eng. (Korea), 2, 489-492 (in Korean with English title). Miya, A., Adachi, T., Tazawa, R., Suzuki, S., Kanki, R., Toyobe, M., Oguchi, M.: 1994: Gas revitalization by microalgae II. CO2/O2 gas exchange system. : CELSS J., 7, 29-34 (in Japanese with English summary). Seo, P-S., Yokota, A.: 2003: The phylogenetic relationships of cyanobacteria inferred from 16S rRNA, gyrB, rpoC1 and rpoD1 gene sequences. : J. Gen. Appl. Micobiol., 49, 191-203. Suzuki, S., Tazawa, R., Miya, A., Adachi, T., Kanki, R., Toyobe, M., Oguchi, M.: 1994: Gas revitalization by microalgae. I. Studies on species and culture condition. : CELSS J., 7, 23-28 (in Japanese with English summary). Toyomizu, M., Suzuki, K., Kawata, Y., Kojima, H., Akiba, Y.: 2001: Effective transformation of the cyanobacterium Spirulina platensis using electroporation. : J. Appl. Phycol., 13, 209-214. Watanabe, F., Miyamoto, E., Nakano, Y.: 2001: Inactive corrinoid-compound significantly decreases in Spirulina platensis grown in a cobalt-deficient medium. : J. Agric. Food Chem., 49, 5685-5688. Watanabe, M. M., Ichimura, T.: 1977: Fresh- and salt-water forms of Spirulina platensis in axenic cultures. : Bull. Jpn. Soc. Phycol., 25, Suppl. (Mem. Iss. Yamada), 371-377. Lu, J., Takeuchi, T.: 2004: Spawning and egg quality of the tilapia Oreochromis niloticus fed solely on raw Spirulina throughout three generations. : Aquaculture, 234, 625-640. Ohmori, K., Ohmori, M.: 1988: Ammonium assimilation in the blue-green alga Spirulina platensis. : Jpn. J. Phycol., 36, 12-16. Ohmori, K., Hirose, M., Ohmori, M.: 1993: An increase in the intracellular concentration of cAMP triggers formation of an algal mat by the cyanobacterium Spirulina platensis. : Plant Cell Physiol., 34, 169-171. Hirano, M., Mori, H., Miura, Y., Matsunaga, N., Nakamura, N., Matsunaga, T.: 1990: γ-ｌinolenic acid production by microalgae. : Appl. Biochem. Biotechnol., 24/25, 183-191. Hamana, K., Miyagawa, K., Matsuzaki, S.: 1983: Occurrence of syn-homospermidine as the major polyamine in nitrogen-fixing cyanobacteria. : Biochem. Biophys. Res. Commun., 112, 606-613. Lu, J., Satoh, H., Takeuchi, T.: 2008: Development of models of threshold and efficient algal densities for larval and juvenile tilapia Oreochromis niloticus on raw Spirulina. : Aquaculture, 285, 249-254. Lu, J., Takeuchi, T., Satoh, H.: 2004: Ingestion and assimilation of three species of freshwater algae by larval tilapia Oreochromis niloticus. : Aquaculture, 238, 437-449. Lu, J., Takeuchi, T., Satoh, H.: 2006: Ingestion, assimilation and utilization of raw Spirulina by larval tilapia Oreochromis niloticus during larval development. : Aquaculture, 254, 686-692. Fujisawa, T., Narikawa, R., Okamoto, S., Ehira, S., Yoshimura, H., Suzuki, I., Masuda, T., Mochimaru, M., Takaichi, S., Awai, K., Sekine, M., Horikawa, H., Yashiro, I., Omata, S., Takarada, H., Katano, Y., Kosugi, H., Tanikawa, S., Ohmori, K., Sato, N.,Ikeuchi, M., Fujita, N., Ohmori, M. : 2010: Genomic structure of an economically important cyanobacterium, Arthrospira (Spirulina) platensis NIES-39. : DNA Res., 17, 85-103. Tanioka, Y., Miyamoto, E., Yabuta, Y., Ohnishi, K., Fujita, T., Yamaji, R., Misono, H., Shigeoka, S., Nakano, Y., Inui, H., Watanabe, F. : 2010: Methyladeninylcobamide functions as the cofactor of methionine synthase in a cyanobacterium, Spirulina platensis NIES-39. : FEBS Lett., 584, 3223-3226. Miklaszewska, M., Waleron, M., Morin, N., Calusinska, M., Wilmotte, A., De Marsac, NT., Rippka, R., Waleron, K.: 2012: Elucidation of the gas vesicle gene clusters in cyanobacteria of the genus Arthrospira (Oscillatoriales, Cyanophyta) and correlation with ITS phylogeny. : Eur. J. Phycol., 47, 233-244. Choi, G-G., Ahn, C-Y., Oh, H-M.: 2012: Phylogenetic relationships of Arthrospira strains inferred from 16S rRNA gene and cpcBA-IGS sequences. : Algae, 27, 75-82. Aikawa, S., Izumi, Y., Matsuda, F., Hasunuma, T., Chang, J.-S., Kondo, A.: 2012: Synergistic enhancement of glycogen production in Arthrospira platensis by optimization of light intensity and nitrate supply. : Biores. Technol., 108, 211-215. 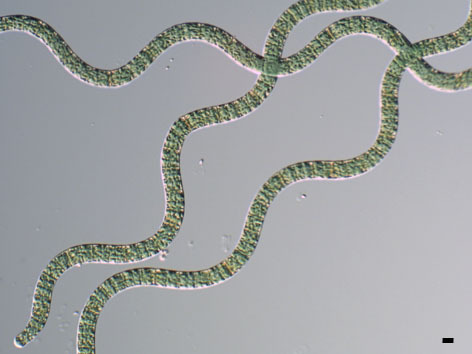 Shiraishi, H., Tabuse, Y.: 2013: The AplI restriction-modification system in an edible cyanobacterium, Arthrospira (Spirulina) platensis NIES-39, recognizes the nucleotid sequence 5'-CTGCAG-3'. : Biosci. Biotechnol. Biochem., 77, 782-788. Kim, C.-J., Jung, Y.-H., Ahn, C.-Y., Lee, Y.-K., Oh, H.-M.: 2010: Adsorption of turbid materials by the cyanobacterium Phormidium parchydematicum. : J. Appl. Phycol., 22, 181-186. Yukino, T., Hayashi, M., Inoue, Y., Imamura, J., Nagano, N., Murata, H.: 2005: Preparation of docosahexaenoic acid fortified Spirulina platensis and its lipid and fatty acid compositions. : Nippon Suisan Gakkaishi, 71, 74-79 (in Japanese with English summary). Izumi, Y., Aikawa, S., Matsuda, F., Hasunuma, T., Kondo, A.: 2013: Aqueous size-exclusion chromatographic method for the quantification of cyanobacterial native glycogen. : J. Chromatogr. B, 930, 90-97. Yoshikawa, T., Ikeda, Y., Sakata, T., Maeda, H.: 2011: Cloning and analysis of the ggpS gene from cyanobacteria Arthrospira spp. involved in the synthesis of an osmolyte glucosylglycerol. : Biocontrol Science, 16, 55-61. Hasunuma, T., Kikuyama, F., Matsuda, M., Aikawa, S., Izumi, Y., Kondo, A.: 2013: Dynamic metabolic profiling of cyanobacterial glycogen biosynthesis under conditions of nitrate depletion. : J. Exp. Bot., 64, 2943-2954. Sasaki, K., Marquez, F. J., Nishio, N., Nagai, S.: 1995: Promotive effect of 5-aminolevulinic acid on the growth and photosynthesis of Spirulina platensis. : J. Ferment. Bioeng., 79, 453-457. Aikawa, S., Joseph, A., Yamada, R., Izumi, Y., Yamagishi, T., Matsuda, F., Kawai, H., Chang, J.-S., Hasunuma, T., Kondo, A.: 2013: Direct conversion of Spirulina to ethanol without pretreatment or enzymatic hydrolysis processes. : Energ. Environ. Sci., 6, 1844-1849. Kamata, K., Piao, Z., Suzuki, S., Fujimori, T., Tajiri, W., Nagai, K., Iyoda, T., Yamada, A., Hayakawa, T., Ishiwara, M., Horaguchi, S., Belay, A., Tanaka, T., Takano, K., Hangyo M.: 2014: Spirulina-templated metal microcoils with controlled helical structures for THz electromagnetic responses. : Sci Rep, 4, 4919 (article ID). Kim, C.-J., Hung, Y.-H., Oh, H.-M,: 2007: Factors indicating culture status during cultivation of Spirulina (Arthrospira) platensis. : J. Microbiol., 45, 122-127. Kim, B.-H., Oh, H.-M., Lee, Y.-K., Choi, G.-G., Ahn, C.-y., Yoon, B.-D., Kim, H.-S.,: 2006: Simple method for RNA preparation from cyanobacteria. : J. Phycol., 42, 1137-1141. Nogami, R., Nishida, H., Hong, D. D., Wakisaka, M.: 2016: Growth promotion of Spirulina by steelmaking slag: application of solubility diagram to understand its mechanism. : AMB Express, 6, 96 (article ID). Toyoshima, M., Aikawa, S., Yamagishi, T., Kondo, A., Kawai, H.: 2015: A pilot-scale floating closed culture system for the multicellular cyanobacterium Arthrospira platensis NIES-39. : J. Appl. Phycol., 27, 2191-2202. Shiraishi, H.: 2015: Association of heterotrophic bacteria with aggregated Arthrospira platensis exopolysaccharides: implications in the induction of axenic cultures. : Biosci. Biotechnol. Biochem., 79, 331-341. Shiraishi, H.: 2016: Cryopreservation of the edible alkalophilic cyanobacterium Arthrospira platensis. : Biosci. Biotechnol. Biochem., 80, 2051-2057. Yoshikawa, K., Aikawa, S., Kojima, Y., Toya, Y., Furusawa, C., Kondo, A., Shimizu, H.: 2015: Construction of a genome-scale metabolic model of Arthrospira platensis NIES-39 and metabolic design for cyanobacterial bioproduction. : PLoS One, 10, e0144430 (article ID). Aikawa, S., Ho, S-H., Nakanishi, A., Chang, J-S., Hasunuma, T., Kondo, A.: 2015: Improving polyglucan production in cyanobacteria and microalgae via cultivation design and metabolic engineering. : Biotechnol. J., 10, 886-898. Andemichael, H., Lee, J. W.: 2016: Toxicological study of biofuel ethanol with blue green alga Spirulina platensis. : Algal Research, 18, 110-115. Motwalli, O., Essack, M., Jankovic, BR., Ji, B., Liu, X., Ansari, HR., Hoehndorf, R., Gao, X., Arold, ST., Mineta, K., Archer, JA., Gojobori, T., Mijakovic, I., Bajic, VB. : 2017: In silico screening for candidate chassis strains of free fatty acid-producing cyanobacteria. : BMC Genomics, 18, 33 (article ID). Tadama, S., Shiraishi, H.: 2017: Growth of the edible microalga Arthrospira platensis in relation to boron supply. : International Journal of GEOMATE, 12, 90-95. Misumi, M., Katoh, H., Tomo, T., Sonoike, K.: 2016: Relationship between photochemical quenching and non-photochemical quenching in six species of cyanobacteria reveals species difference in redox state and species commonality in energy dissipation. : Plant Cell, 57, 1510-1517. Reichert,M., Bergmann,S. M., Hwang, J., Buchholz, R., Lindenberger, C.: 2017: Antiviral activity of exopolysaccharides from Arthrospira platensis against koi herpesvirus. : J. Fish Dis., 40, 1441–1450. Kishi, M., Toda, T.: 2018: Carbon fixation properties of three alkalihalophilic microalgal strains under high alkalinity. : J. Appl. Phycol., 30, 401–410. Kerfeld, CA., Melnicki, MR., Sutter M., Dominguez-Martin, MA. : 2017: Structure, function and evolution of the cyanobacterial orange carotenoid protein and its homologs. : New Phytol., 215, 937-951. Silas, S., Makarova, KS., Shmakov, S., Páez-Espino, D., Mohr, G., Liu, Y., Davison, M., Roux, S.9, Krishnamurthy, SR., Fu, BXH., Hansen, LL., Wang, D., Sullivan, MB., Millard, A., Clokie, MR., Bhaya, D., Lambowitz, AM., Kyrpides, NC., Koonin, EV., Fire, AZ. : 2017: On the origin of reverse transcriptase using CRISPR-Cas systems and their hyperdiverse, enigmatic spacer repertoires. : mBio, 8, e00897-17 (article ID). Nogami, R., Nishida, H., Hong, D. D., Wakisaka, M.: 2017: Growth promotion effect of alginate oligosaccharides on Spirulina analyzed by repeated batch culture. : J. Jpn. Inst. Energy, 96, 352-356. Lin, W., Zhao, D., Luo, J.: 2018: Distribution of alkaline phosphatase genes in cyanobacteria and the role of alkaline phosphatase on the acquisition of phosphorus from dissolved organic phosphorus for cyanobacterial growth. : J. Appl. Phycol., 30, 839-850. Aikawa, S., Inokuma, K., Wakai, S., Sasaki, K., Ogino, C., Chang, J-S., Hasunuma, T., Kondo, A.: 2018: Direct and highly productive conversion of cyanobacteria Arthrospira platensis to ethanol with CaCl2 addition. : Biotechnol. Biofuels, 11, 50 (article ID). Sugiyama, K., Ebisawa, M., Yamada, M., Nagashima, Y., Suzuki, H., Maoka, T., Takaichi, S.: 2017: Functional lycopene cyclase (CruA) in cyanobacterium, Arthrospira platensis NIES-39, and its role in carotenoid synthesis. : Plant Cell Physiol., 58, 831-838. Garcia, H. F. L.: 2017: Mathematical modelling as a research tool in the cyanobacteria cultivation. : PhD thesis, Friedrich-Alexander-Universität Erlangen-Nürnberg, Germany, 101 pp. Moten, D., Batsalova, T., Basheva, D., Mladenov, R., Dzhambazov, B., Teneva, I.: 2018: Outer membrane efflux protein (OMEP) is a suitable molecular marker for resolving the phylogeny and taxonomic status of closely related cyanobacteria. : Phycol. Res., 66, 31-36.